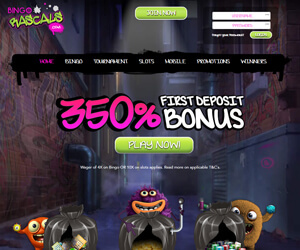 Bingo Rascals Review | Collect your £15 No Deposit + 350% Bonus! 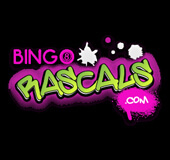 Bingo Rascals has finally been unleashed to cause mischief and mayhem, as the newest online bingo site for 2016! As the cheekiest and coolest new site around, Bingo Rascals is the latest Cozygames production. The site welcomes you to a dark alley, which is tagged with neon-popping green and pink graffiti. A colourful collection of crazy-eyed rascal characters will greet you with their tongues hanging out, ready to offer you a juicy no deposit bonus. You can also collect a welcome bonus package and unstoppable promotions! While you navigate around their mischievous world, you can get stuck into a devilish collection of bingo, slots, casino, scratchcard, side games, mobile and jackpot specials! The cheeky Rascals may be ready to get up to no good, but they will greet you with an awesome £15 Free Welcome Bonus with no deposit required! When you deposit your first £10, you can pick up an amazing 350% first deposit sign-up offer. On your first three deposits, you can pick up a huge 500% bonus. When you begin playing, the rascals have a few more sizzling promotions up their sleeves. These include Free Bingo Xtravaganza, 1K Mega Giveaway, Weekly Cashback, Break-time Quizzes and Refer a Friend. You can also enjoy loyalty rewards, Jackpot Specials and Money Multipliers. If you join the other friendly rascals in the Chat Community, you can also play Chat Games for extra prizes. Watch this space for the latest coupon codes! Bingo Rascals boasts a mischievous collection of entertaining Bingo, slots and casino games. Some of the featured games include 90 Ball Big Ben, 80 Ball London Hall and 75 Ball Buckingham Palace. Others include 30 Ball City Hall and the super cool 90 Ball Mega Jackpot! You can also enjoy Free Bingo Tournaments like Wizard of Bingo, scratch cards, instant win games, plus 2 free Bingo rooms. Hit the slots to adventure through hit releases like Arabian Nights, Coffee House, Easter Bunny, Cupid's Arrow and Five Pirates. If you're craving a casino fix, you can feel the rush with and table tournaments like Multi Hand European Blackjack and Roulette! The cheeky Bingo Rascals have also been unleashed on tablets & mobiles, so you can login from your smartphone, android, iphone, ipad and more!